If you were to judge the Micro Express AL5100 by its elegantly plain, silver-and-black shell, you might not guess what a powerhouse system it is. But the state-of-the-art components hidden beneath its modest facade offers impressive performance. Screen elements pop onto the screen swiftly, the unit boots like lightning, and 1080p video is smooth as silk. The system costs $1200, but if you have a need for stealthy speed, this laptop will repay your investment. Probably the most striking feature of the AL5100 is its display: You don't see many 15.6-inch displays with 1920 by 1080 resolution. In fact, that resolution can make menu and icon text a bit difficult to read. But if you change the settings in Control Panel/Appearance and Personalization/Display to 125%, it'll be fine even for older eyes. Though the AL5100's GPU garnered a nice score, it fizzled slightly at 1920 by 1080 resolution and high or ultra-high detail. But all of the games in our test suite played just fine at resolutions up to 1366 by 768. Turning to more general performance, the AL5100 recorded a dazzling score of 202 on our WorldBench 7 test suite. The AL5100's WorldBench 7 score. 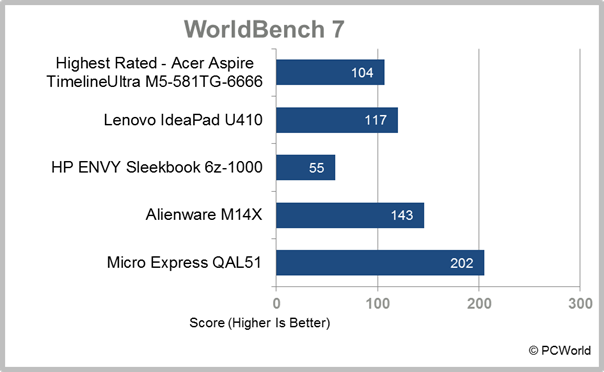 The core components that helped deliver that excellent WorldBench 7 score are an Intel Core i7-3840QM CPU, 16GB of DDR3 1600 RAM, an Nvidia GeForce GT 650M graphics card, and a very fast 240GB Intel solid-state drive. The only component that lags behind the curve is the DVD-RW burner. Blu-ray would be a perfect match for the 1080 display, and its absence here is a bit of a puzzle, setting aside the impulse to achieve a slightly lower price or a slightly higher profit margin. To see movies on this unit, you'll have to rip them to the internal drive or use an external drive. If you really crave Blu-ray, you can swap in a 2X Blu-ray combo drive for $75 extra. 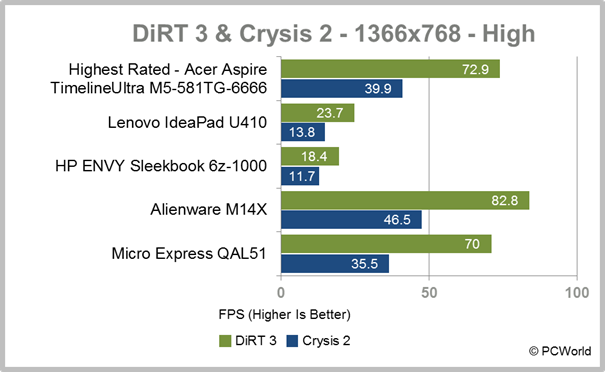 The laptop's gaming performance was quite good; our test model posted an overall gaming score of 97. Storage performance impressed us, too, no doubt due in part to the Intel 240GB SSD. It's a measure of how far SSD prices have come down that we now see SSDs of reasonably large capacity in general-purpose laptops priced at under $1200. The keyboard on the AL5100 has a very nice feel. Its layout is spacious, though I would have preferred to have the keypad separated a bit more from the main keys. The touchpad's rough texture is all that distinguishes it from the rest of the keyboard deck. You may like this style decision; I prefer smooth and recessed. The buttons respond audibly and smoothly, and a biometric fingerprint reader sits between them. Ports and connectivity are top-notch on the AL5100. You get two USB 3.0 ports on the left side) and two USB 2.0 ports on the right side, along with legacy VGA, HDMI video output, and headphone and microphone jacks. A separate mic next to the webcam lets you forgo use of a headset for audio/video chat. Situated lower than usual on the bottom front of the unit is an SD Card reader that you can easily overlook on first inspection. Other features include gigabit ethernet, 802.11b/g/n Wi-Fi, and Bluetooth 3.0. The AL5100: right side view. Despite carrying a decent-size, 7800mAh battery, the AL5100 ran for only about 4 hours, 41 minutes—considerably less time than some admittedly less-powerful rivals managed. 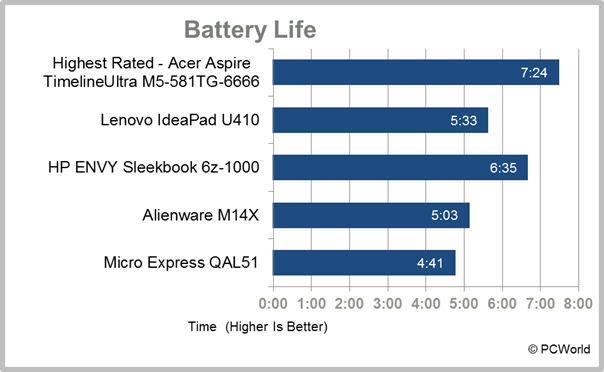 Still, given the high-resolution screen, the quad-core processor, and the overall speed of the laptop's components, delivering almost coast-to-coast battery life is acceptable. The back-mounted battery extends significantly below the bottom of the laptop to give the AL5100 a nice forward rake that facilitates comfortable typing. 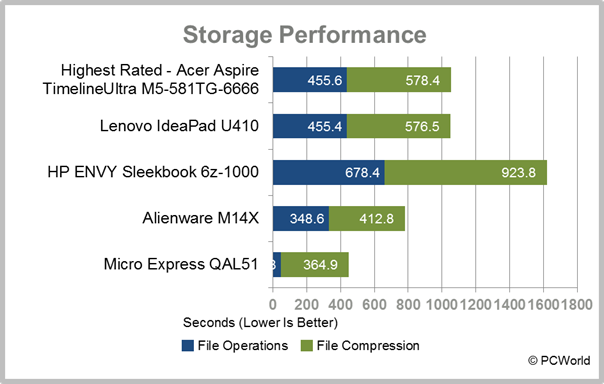 Micro Express provisioned the AL5100 with 64-bit Windows 7 Home Premium, but little in the way of third-party software. The only applications on hand are those in the CyberLink Media Suite, which leverages the DVD drive. The absence of a restore partition is understandable on a 240GB SSD, though having the option would have been nice. On a different tack, audio through the speakers sounds clear enough, though there's no subwoofer to provide bass and response is heavily skewed to the midrange. The 2 megapixel CMOS webcam provides a very clear, and surprisingly smooth picture. The AL5100 features a Trusted Platform Module, though it was disabled in the BIOS on our test unit. Corporate shops will appreciate that, the aforementioned biometrics, and the two-year warranty with a $99 option for a third year. The AL5100 is extremely fast, has a great display with 1080p resolution, and is state-of-the-art (aside from lacking Blu-ray). The sub-5 hour battery life may be a concern for some prospective buyers; but given the performance level, it's understandable. The weight of 5.5 pounds isn't too burdensome for a 15.6-inch laptop, either, though it will certainly seem a bit hefty compared to an Ultrabook. If you need to be up and computing in a hurry, and you don't want to waste time while you're at the keyboard, this is a a must-shop laptop.